Finally, pajama pants are now acceptable for everyday wear. 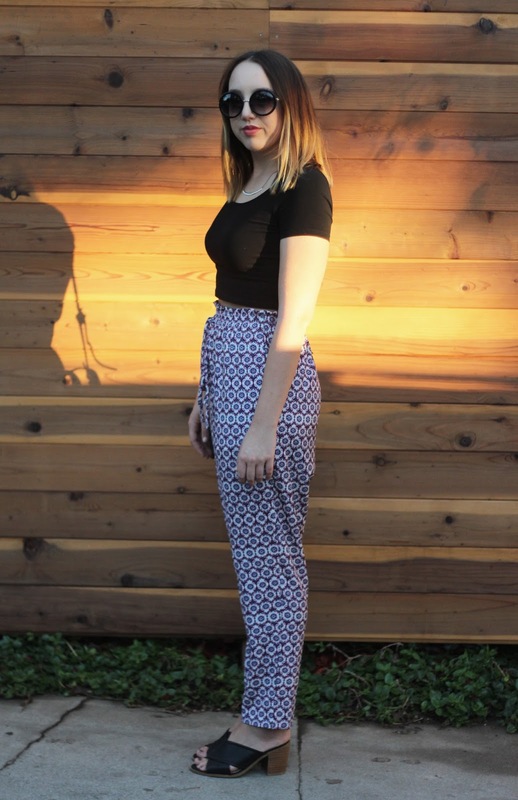 I have been crazy about printed pants for a while now but finding the right fit, feel, and print is key. I was graciously given these pants by eShakti.com, a website that offers customizable clothing. Finally, all of us who feel we are the in between with sizes can confidently order something off the internet. Regarding the fit and quality of the pants, I have no complaints. They are not see through in the slightest - aka I can wear my bright pink underwear proudly, like the obnoxious nineteen year old I am. I customized the height to fit me perfectly and the drawstring detailing at the top is nicely done and makes the pants immensely more flattering. The pants are definitely a statement piece so I paired them with staples: a basic black crop top, my typical black structured bag, and my leather mules that still confuse some people. The sunglasses made me feel cool, which is one of the most important qualities I look for in a pair. I do not think I am compatible with accounting. I recently realized that the full body mirror I have hanging in my room is slightly warped and makes my body appear thinner than it actually is. This is my first finding of blissful ignorance, because I do not need to know the actual appearance of my body because all that matters is how I feel about it. It's easier to write that out than to actually convince myself of it. "If nothing we do matters, then all that matters is what we do." If I am so incredibly insignificant, then there is validity in what I do just because that's what I do. I have to believe this. That is all for now. Hope you enjoy!